Can You Afford to be a Stay-at-Home Mom? I always wanted to be a 100% stay-at-home mom. But, like many families, money was a little tight so I made the decision to work for a season. When I started staying home full time, I was able to cook more so we spent less money on convenience foods and restaurant meals. Even so, I was still shocked to find that without trying, our grocery & eating-out budget dropped by over $300 per month. I’m sure that if I clipped coupons or shopped sales, I’d save even more. Obviously, if I’m not driving to and from work, a sitter’s, etc. then I’m saving money in gas. Many families are able to get rid of a car when one spouse stays home, thus saving even more. I didn’t pay much in childcare because my mother-in-law babysat or I’d take the girls with me to work (a benefit of being married to my boss!). But we did have a mother’s helper come one day a week for two solid years to help with schoolwork and cleaning. Nathan and I had also discussed hiring out for laundry or yard-work. 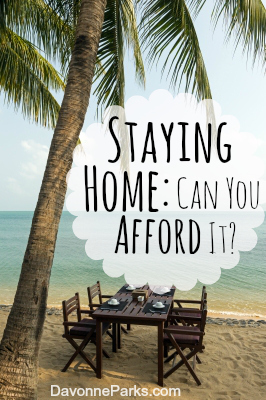 Staying home negates the need – and expense – for all of those things. Whether I’m at the office or in my home, I do want to look nice. But when I’m home I can get away with wearing a smaller – and less expensive – variety of clothing than I could otherwise. 5) Things for my children. It’s not fun to admit, but I often felt guilty about working. And while I didn’t spend a ton on my kids, I would buy them an occasional “treat” to help appease my guilt. Or I’d take them somewhere fun in the evening or on weekends since I wasn’t with them during the day. Now, we find frugal or free things to do and they agree that it’s a worthwhile sacrifice we make in order to be able to stay home together. The bottom line, financially speaking? Without even trying, my family trimmed our budget by $1,000 a month just by me no longer working. Once we started trying, we saved even more! And this was without the cost of childcare – that alone could have easily added an extra $1,000 to our monthly expenses. For a mom who makes $2,000 per month, that’s $461.53 per week or $11.53 per hour for a 40-hour work week. After subtracting 15% (or $69.23 each week) for taxes, that brings the weekly total down to $392.30 which adds up to $1,699.96 per month. Then take a very low work-related expense estimate of $1,000 from the $1,699.96 earned per month, and that leaves the take-home profit at $699.96 per month or $161.53 per week. For a 40 hour work-week that would bring the $11.53 earned per hour down to a total profit of $4.03 per hour. If you’d like to stay home but don’t aren’t sure that you can afford it, really look at your budget. How much would you save in food if you weren’t buying restaurant meals or prepackaged food on a regular basis? What about childcare? Gas money? I gave you an example to help you get started, but don’t just leave it at that. Do the math with your own numbers and figure out exactly how much you’re profiting per hour. And then decide: Is your time worth more than that to you? For my family, the small profit I made simply wasn’t worth the strain it put on all of us. So we decided to cut back. We currently don’t take expensive vacations, we rarely eat in restaurants, we definitely don’t drive fancy cars (our newest vehicle is 13 years old! ), and we only go to the movie theater about twice a year. Yes, staying home can be hard. Yes, I regularly need an hour-long break. And yes, sometimes I think it’d be nice to have more money in the bank. But we have enough. And we’re together. That’s well-worth any financial sacrifice we need to make. 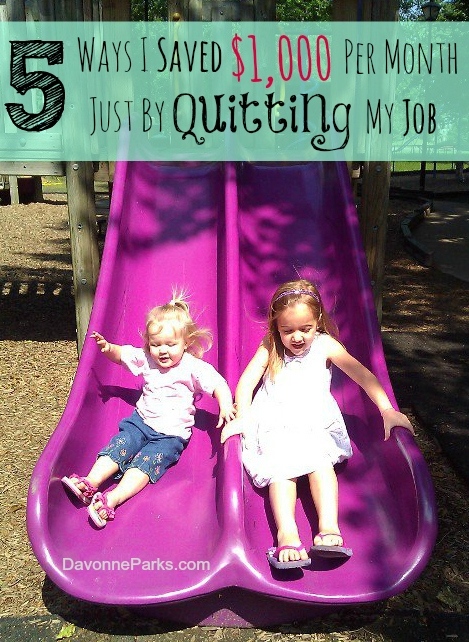 Part One: Can You Afford to be a Stay-At-Home Mom? Part Two: Work from Home Opportunities, Plus 9 Tips You Must Know. Part Three: Work or Stay Home? 10 (Mostly-Unbiased) Things to Consider. Part Four: Question & Answer Session – Money & Marriage, Time-Management. Staying home full time was the better choice for us too. I really struggled working outside the home, and often came home too tired to tend the house or spend quality time with my husband. It was a strain on our relationship. When my car died we decided to try to have me home full time. And after changing our lifestyle a bit, and sacrificing some things we considered luxuries, we saved more money then i made working. We saved on the expenses of owning a second car, we saved on food and eating out, not to mention the time i put in to keep things organized and flowing at home more smoothly. 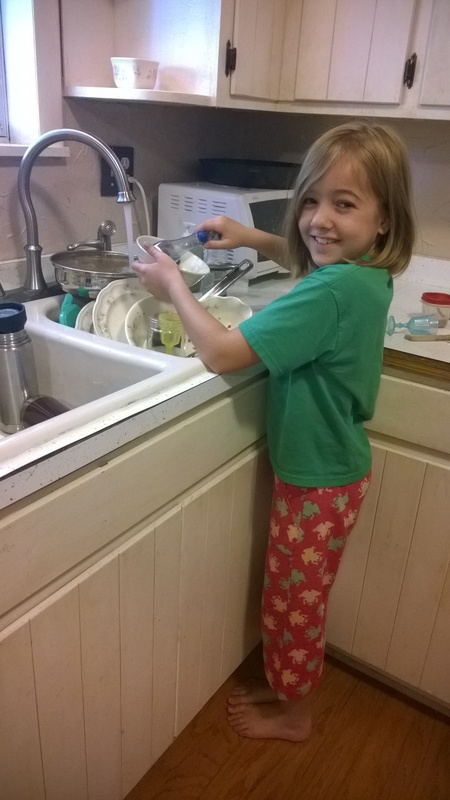 I do all the bookwork, schedule appointments, make sure we are staying within budget, clean, cook, just about everything that keeps the house going. My husband participates and helps out, without complaint, when i am not feeling well, or when i begin to get overwhelmed. We are now expecting our first child, and though my husband did take on a second job to cover the extra medical expenses and to save up some money, he should be able to quite that job a month before my due date. We have even begun to pay our debt and hope to be debt free in a few years. Having one car is kind of inconvenient sometimes, however, now that we will have kids one of our first purchases when we get debt free will be a cheap car for me. Paying cash of course. When i can i do odd job type things to bring in extra money and meet specific goals. Things like selling stuff on ebay or facebook, run a garage sale in the summer, make wreaths at Christmas time, clean a house occasionally for a friend or family member, whatever comes up. My mom always called this “egg money” and said “in the old days, stay at home wives always did odd jobs for money even if they were home, like sell quilts and extra eggs.” In most situations, just because you stay home doesn’t mean you “don’t do anything.” There is plenty to do! And because we are use to living on one main income now, we do not have to go through such a huge financial adjustment that a lot of families have to go through when a baby is born and a mom then decides to stay home. I understand staying at home is not for everyone, but it is possible for most people who wish to do it. It just takes a lot of work and sacrifice. We may not have a high standard of living, but we are happier in our marriage and i feel far more fulfilled personally. Thank you so much for sharing your story, Rachel. It sounds like you and your husband and you have a wonderful system worked out together. And congratulations on your baby!